electro-music.com :: View topic - Monotron Duo. Posted: Wed Feb 29, 2012 2:06 am Post subject: Monotron Duo. Subject description: Anyone cut theirs up yet? 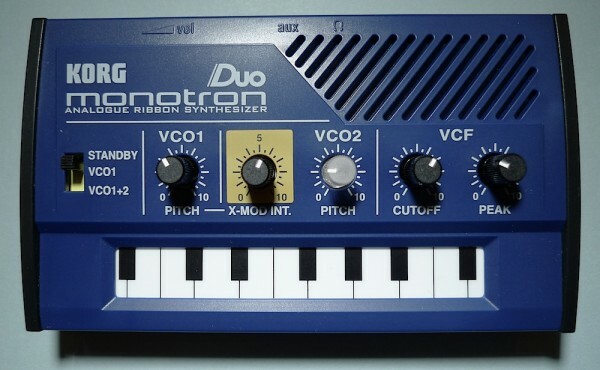 So along with my usual patch cables I had a bit of an impulse buy at Sweetwater -- picked up a monotron duo. I was sad to see that it's a bit different from the original... There's no handy "pitch" pad on the back. There are discrete pads for saw, pulse, and square waveforms for both oscillators, though. Pitch appears to swing from 0-3v; gate is + 5v. There is a "vbias" pad and a "vrib" on the back. Haven't tried injecting anything in there yet. The ribbon appears to be a 10k POT. One of the lines only connects when you press down for gate. Anyway, I was hoping someone came up with a good explanation of vbias and vrib? I'll post pics tomorrow if no one else already has nicely annotated photos. Looking forward to seeing your results. If you look at the schematic of the original Monotron (available from Korg) you can see that the supplies are unipolar throughout (0V and +5V). 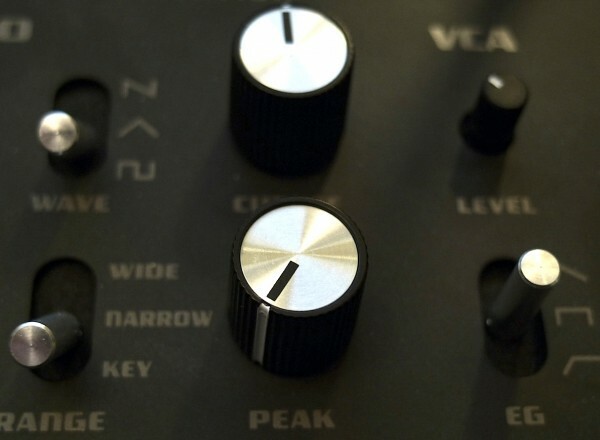 Vbias acts as a "mid-point" voltage reference where the circuitry requires it. The Duo doesn't seem to have arrived in the UK yet, but I'm expecting a Monotron Delay early next week. Life is like an analogue sequencer. Twiddle the knobs to avoid boredom. 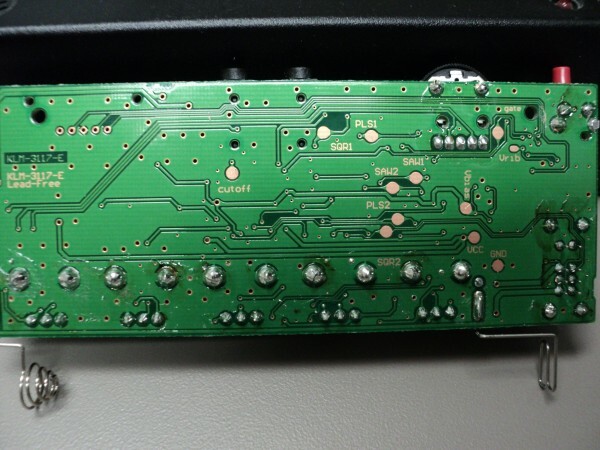 Here's the top and bottom of the PCB. Crap resolution on the top, but uh.... I can't imagine it would be too useful to anyone anyway since you ain't tracin' this out from a photo. Working left to right we have TI MSP430 G2231 microcontroller (surprise! 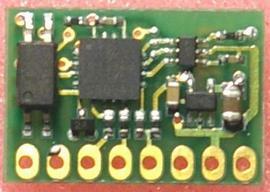 ), an LM324, an SN74AHC14 hex schmidt trigger inverter, another LM324, and finally a TPA6111 headphone amplifier. Given the fact that there's a couple blank pads for missing ICs and caps, additional waveforms and a seriously underutilized microcontroller, I think it's safe to assume that the Monotron Delay uses essentially the same board. Hi that's the point where I am at now. I noticed right away the Duo is laid out a little differently. I opened up the Duo and can clearly see the "gate" point but no "pitch" point labelled like on the original. While I have mine opened I would like to solder the wires for the simple note on/off for CV/Gate etc so I can play or sequence it with something. What point do I need to solder for pitch? Seems like 'VRIB' should do something, like add your CV to the ribbon wiper voltage. Nice. I'Ve been meaning to do that to my tiptop 808 modules. Looks good. more mods on their way soon! Thank you for the reply. So far I have only soldered one wire to the DUO's Gate pad. I ordered this board made for the Monotron http://www.midi-hardware.com/img/minicv.jpg which should make things a little easier however the directions show connecting the Gate and the Pitch for the original Monotron. I am getting little frustrated wondering what I am going to do to access the Monotron's 's' power after the DC Booster. I am told to use a volt meter to find it but then what for a noob like me? I know more than I think I do but I can't afford to screw this up. This occurred to me as well -- I'd love to hear some samples. - Vbias is the +3.36 "middle" voltage between GND and VCC. - The MSP430G2231 is a microcontroller from TI that could be possibly reprogrammed by me to directly add a MIDI input to the Monotron Duo! 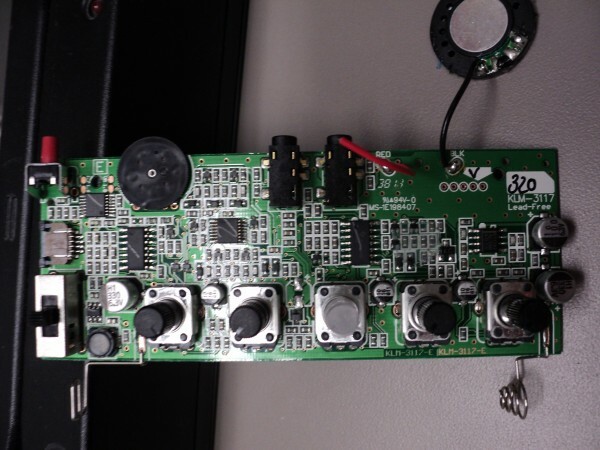 order to control the VCO CV (0V-3.3V) + it outputs a 3.3V Gate signal. This is just what I see from the Monotron Duo schematic. I hope to get my monotron soon. Would anybody be interested on a minimal MIDI mod for the Duo (with Filter CV control)? It might be possible that I'll make some PCBs. I would be interested in one of those boards. On an aside, can anyone confirm that a value of "NU" on the Monotron Duo schematic indicates "Not Used" ? Had my Monotron Duo for a couple weeks now. Just put together the MIDI-IF kit but I'm stuck as well. Firstly, the missing Pitch CV. Also, I remember there's a resistor on the original monotron that needed to be desoldered to permanently disconnect the ribbon and well the bits are definitely different. The button for scale changes may have something to do with it. If anyone else finds the solutions I'd love to hear. I'll let you know if I manage to hack it right. Finally picked up a DUO today! Anyhow...I haven't had this thing for an hour and what do I do? Come here to see what you guys have done to them! multimeter, there must be a sweet spot for that pitch wire. Please let us know if that ends up being true. If that's the case then that would be a whole easier than the other ways at leas having that one place to plug into however it is still soldering as opposed to plugging into a serial port as on the Monotribe. I consulted with two people about the DUO board and neither one could say for sure what exactly is needed to have basic MIDI control without a lot of trial and error ie. soldering and de-soldering if the one idea didn't work. it's the same microcontroller of the TI launchpad!!!!!! P1.7 and P1.6 are free so maybe a software uart??? It they don't have put it already someone with a monotron duo and an oscilloscope out there? I think that with a pic and a dac (or maybe a pwm output) that replace ribbon controller all the monotron pitch can be controlled by midi/some other stuff!!! the ribbon is basically a 0-5v pot!!!! Hi, a friend of mine has got a monotron duo and we were doing some multimetering the other day to find out if there's a sweet spot for pitch CV. The pads labeled SAW1, SAW2, SQU1 etc. gave us steady voltages no matter whether the ribbon was pressed or not or where on the ribbon. The pad labeled Vrib gves the output of the ribbon voltage (hence the name) and it goes from a low voltage (I don't remember if it was zero volts) to full voltage (3V). There also is a point we found using the schematics but there's no real pad connected to it, only one of these really small hole-y things (don't know what they're called - solder-hole?). This point is at the joint of the pitch output from the MSP430G2231 (pin 4) with R7 (56k). 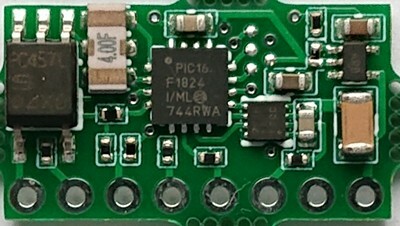 R7 is located in an array of resistors on the side of the board near the MSP430G2231. It's the resistor in the right bottom corner. Without pressing the ribbon this point puts out some changing voltage much like an lfo (it sounds like an lfo too when you send a gate to the monotron but no pitch CV). When the ribbon is pressed it puts out varying Voltages. We found out that it uses 0,23V/Oct. but mirrored, so that for instance the low C is 0,23V above the high C.
However when we tried to input some Voltage there nothing changed, the monotron was just playing the same low modulated tone. These are our results so far, maybe someone can figure out what that means? i try to mod my monotron Duo.I've measured vrib against gate, and played on the ribbon controller.The multimeter showed diffrrent Volt status, like to be needed to feed in CV in vrib while gate is active.IT'll take me time to to build a midi-mod for the DUO.I'll write back. Posted: Sat Apr 28, 2012 9:31 am Post subject: Monotron Duo Hz/OCT? I measured vrib to gate while playing on the ribbon and it showed a differrence of 2 Volt between 1 Octave.The Conclusion is the CV reacts in Hertz/Voltage ratio( Hz/Oct like the old MS20).Has anyone same Results?I read that MS20 and MS10 had an external Pot to lower the Rate to 1V/OCT.But Hz/Oct is exponential und V/OCT linear.If the monotron duo pitchscale is really Hz/OCT how do i modificate it?